The 15th SAARC (South Asian Association for Regional Cooperation) Summit was successfully concluded in Colombo and was attended by a pantheon of South Asian leaders as well as other dignitaries from Observer States. The proceedings and other concomitant engagements of the one week high profile international Summit were conducted with a great degree of efficacy, finesse and coordination. It may be reasonable to state that almost all of the leaders of South Asia, dignitaries from Observer States, delegates, foreign media and diplomatic corps as well as invitees, both foreign and local, were impressed of the competence and capacity to organise a major international Summit of such scale. It may further be stated that the 15th SAARC Summit in Colombo was held under exacting circumstances and vicissitudes, particularly with regard to security. The theme of the SAARC Summit was “SAARC Partnership for Our People”, which closely correlated with the theme of the last year’s SAARC Summit, which was ‘Connectivity’. Indisputably, the Colombo SAARC Summit enhanced the profile and the stature of the country not only regionally but internationally as well. Sri Lanka assumed the Chairmanship of the world’s most populous and one of the most endowed regional blocs i.e. SAARC. The assumption of the Chairmanship of the SAARC would cogently reflect the pro-active engagement of the country in geo-political and geo-economic issues in the region, in particular and the world, in general. It may also be noted that Sri Lanka took over the mantle of the Chair of SAARC from its most endowed and largest member i.e. India. The Chair of the SAARC would probably be one of the highest international offices she has ever assumed in the world. As the Chair of the SAARC, Sri Lanka has the privilege to articulate and accentuate positions and issues, on behalf of the SAARC, with other regional blocs and groupings such as the EU, NAFTA, ASEAN, GCC, Mercusor, OIC, G-8, G-15, Commonwealth, IOR-ARC and APEC among others. The very fact of comprehensive and constructive engagement with the leaders of South Asia and other Observer States such as the US, the EU, China, South Korea, Mauritius and Iran has evolved Sri Lanka as a country which plays a pivotal and central role vis-a-vis regional and global dynamics and developments. The Chair of the SAARC and the Chair of the SAARC Council of Ministers lever a significant degree of influence, regional might and due deference, which in turn could be executed to achieve the objectives of the country as well as of the region. Almost all the members of the SAARC as well as some of the Observer States are confronting the nefarious and heinous acts of terrorism. Today, terrorism has become ubiquitous and omnipresent, and as the Chair of the SAARC, it offers Sri Lanka a vantage and a unique opportunity to address terrorism in all its manifestations. The signing of the Agreement on Mutual Assistance on Criminal Matters would be most beneficial to the region of SAARC as well as to Sri Lanka. The execution of this Agreement could amass conspicuous benefits to Sri Lanka, with regard to terrorism. It would have been noted that most of the addresses of the Heads of State/Government and Observer States vehemently condemned terrorist activities unconditionally and unequivocally. It may further be noted that such concerted and unison addresses, with regard to countering terrorism, at the zenith of respective Governments, would no doubt, be beneficial to Sri Lanka as well. On a different note, one can state that well over 20 bilateral meetings between the leadership of Sri Lanka, including the President and the Minister of Foreign Affairs of Sri Lanka, and Member States of SAARC and Observer States took place in Colombo, on the margins of the SAARC Summit. The leaders of the other countries too called on and met their counterparts in Colombo, thus extending publicity and enhancing the profile of the country as a “meeting place”. It was interesting to observe that over 25 - 30 such meetings between Heads of State/Government, Ministers of Foreign Affairs and Leaders of Delegations had taken place in Colombo. It is needless to state that such meetings on the side lines of the SAARC Summit in Colombo would convincingly reflect the stability, peace, safety and capacity of the city of Colombo and the country. Many of these high profile meetings were transmitted in foreign electronic media and published in print media. Given this premise, one could elicit the fact that the best and most efficacious course of action to counter, so called travel advisories issued by certain countries would be to globally demonstrate the stability and safety of the country than to counter them with responses and rejoinders. One could further perceive the fact that hosting a Summit with such aplomb and meticulousness would stimulate economic and commercial activity as well. Generally, the two-day Council of Ministers Meeting of SAARC exceeds the allocated time and the officials often used to work till late in the night, in order to have a comprehensive consensus. The success of the Summit, which is attended by none other than the Heads of State/Government, would reflect the success and mutual accomplishments of the Council of Ministers Meeting. President Mahinda Rajapaksa along with the Foreign Minister forged and intensified political relations with the respective counterparts, which in turn could be transcended and transformed into political and economic utility. The presence of a large number of media personalities, not only from the region but also from other parts of the world, extended extensive coverage of the Summit as well as meetings and parleys between the leaders. Many a persons raise the crucial issue of the economic benefits and utility, the country garnered from the SAARC Summit. Being an international corporate executive and entrepreneur, I am of the conviction that this question is most reasonable and deserved to be expounded, in detail. The Summit discussed measures to establish the physical connectivity between and among the capital cities as well as other major cities of the SAARC region. Physical connectivity, which was the theme of the last year SAARC Summit held in New Delhi, addressed not only air connectivity but land and sea as well. It would be presumptuous to impress the benefits of greater connectivity, in the economic dimension, since connectivity would stimulate economic and commercial activity ranging from trade, services, food security, tourism, oil and natural gas, foreign direct investments, foreign institutional investments, merges and acquisitions and international joint ventures among others. The concept of connectivity, if and when transformed in to physical connectivity, could markedly alleviate poverty from the region as well. We are well aware that the region of SAARC has one of the highest levels of poverty. It is correct to state that the rapid development and advancement of the EU was physical connectivity and it is not alien to many a regions, which have developed, in the world. Connectivity along with the theme of this Summit i.e. SAARC: Partnership for our People, could create a strong kinetic synergy between and among the peoples of the SAARC region. The establishment of the SAARC University in New Delhi would benefit the region and would enhance the quality of the human resources. It is envisaged that this University would be on par with some of the most elite academic institutions in the world. Needless to state that Sri Lanka would be a beneficiary of the establishment of University of such scale and calibre. The Charter on SAARC Development Fund (SDF) was inked at this Summit. This could be considered as a momentous step towards development of the region since the SAARC Development Fund consists of USD 300 million. The SDF would primarily be used to develop and rehabilitate the infrastructure and alleviate poverty in the region. The Colombo SAARC Summit also discussed and deliberated Food Security and Power & Energy. Both these issues have become indispensable elements for development of the country as well as the region. President Mahinda Rajapaksa stated in his eloquent address to form a Food Bank, which would yet again be beneficial to the entire region. The Agreement on South Asian Regional Standards Organisation was also signed at this Summit. The intrinsic benefits of this initiative would be that the standards of the goods and services would be consonant with each of the countries, thus increasing bilateral and multilateral trade. Also, the standardization would reduce the cost of production as well. The Summit addressed and mapped out the operational aspects and other related dynamics of the SAFTA as well. The region of SAARC, unfortunately, is less integrated than many a regions in the world. As we are aware, the total intra-regional trade is still a mere 5.3% where as other similar regional blocs have intra-regional trade ranging from 25% - 65%. Despite the SAARC region, which consists of 24% of global humanity, the share of the global GDP is yet a mere 2.8%. These bold facts are stated in order to project the opportunities and economic vistas the region, as a whole, could share and develop given the enormous natural endowments she possesses. Having stated this, Iran-Pakistan-India trilateral gas pipeline and hydropower projects which are in the anvil, would be beneficial to Sri Lanka once they become operational. The newest member of the SAARC i.e. Afghanistan, would offer unprecedented opportunities for development of the country, particularly in the construction sector. Sri Lanka could leverage these opportunities and could offer employment to Sri Lankans to be engaged in the construction sector in Afghanistan. One should appreciate the fact that since Sri Lanka holds the office of the Chair of SAARC, it would be much easier for Sri Lanka to duly leverage and mutually exploit such opportunities not only in the region but with other regional blocs as well. Minister Bogollagama, being the Chair of the Council of Ministers, could contact any of his counterpart Ministers in the region as well as the Observer States and discuss issues of relevance and significance. At this era of globalisation, regionalism and economic liberalisation, it is vital for a nation to be actively engaged in the region and preferably play an instrumental role in forging and moulding economic issues in particular, if the nation were to be advanced and developed. It would also to be pertinent to state that vibrant and congenial economic and commercial activity would dilute any political differences between and among countries. The Foreign Minister, in particular, has often accentuated the imperativeness of connectivity and development of the region of SAARC. The total cost of the SAARC is estimated to be in the vicinity of US$ 30 million. It is important to note that 86% of the total budget of the SAARC was expended for capital expenditure. The Colombo SAARC Summit rehabilitated and restored select roads and highways as well as institutions such as the BMICH and the Ministry of Foreign Affairs among others. And 75 per cent of the total budget was spent for security and security related matters and investments. I often used to respond that it was the intangible benefits which cannot be quantified and not the tangible benefits which can be quantified. In other words, it could be equated to somebody who hosts a galaxy of major global investors, industrialists and entrepreneurs for a lavish reception and then somebody asks “what have you gained by entertaining such major investors and entrepreneurs?”. The fact of the matter I wish to accentuate, with deep conviction, is that the relations and friendship as well as the trust the host would establish with the so called ‘guests’ i.e. global investors, could not be quantified but could be used in many a ways such as investments, FDIs, FIIs, international joint ventures, mergers and partnerships and promotion of trade among others. Given this premise, one could quantify the cost and benefit of the so called reception only after a limited length of time. On the same note, it may be germane to state that the Government and the Foreign Minister astutely initiated and convinced the former Chair of the SAARC i.e. 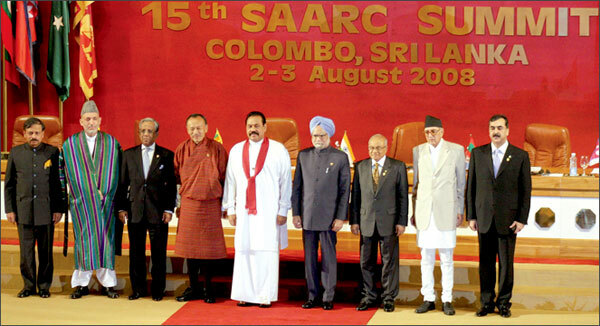 India, to consider Sri Lanka to host the 15th SAARC Summit, since Maldives was eager to host it next year. The immediate tangible economic results of the hosting of the Summit are already lucid and visible since tourism has increased, a sense of stability and predictability have been restored and the Summit enunciated the positive profile of the country, regionally as well as globally. Let me conclude by raising a rhetorical question as to what could be the economic and political price one would place on reinforcing, bolstering and strengthening the relations with the leadership of the SAARC region as well as with other leaders of the Observer States. It would be opportune for one to pay cognisance of the sagacious saying of one of the senior Statesmen in South East Asia that “a nation could choose its friends but not its neighbours”. In the annals of economic and political history, nations have developed in blocs or regions and rarely in isolation. Given this context and dynamics, the leading international economic think tanks state that the fulcrum of political and economic activity is shifting in an inexorable manner towards Asia and away from the traditional and conventional centres of North America and Europe, the assumption of the Chair of SAARC, at this juncture, is most propitious and has increasing potentiality to Sri Lanka. The writer is the President of the Federation of Chamber of Commerce and Industry of Sri Lanka and the Vice President of the SAARC Chamber of Commerce.